Originally aired April 9, 2002 – May 21, 2002. Wow, wow, wow, wow. Rory’s love life is in the middle of quite the predicament. Since the bracelet episode she and Jess have been spending a lot of time together. After a few episodes apart (which we get to see some great Richard and Emily episodes that I’ll talk about later) things really pick up when Luke asks Rory to tutor Jess because he is flunking out. Look, even I admit Jess is being a jerk here. There is nothing I hate more than kids who are smart, but think they’re too cool for school to try. This was the only time I was rooting against Jess this season, but then watching how adorable the two are together and how awkwardly cute their conversations are I realized that I can forgive him. Everything that happens stems from the fact that Jess drove Rory’s car to take them for ice cream while studying. He says they can go back to the diner or turn right to just keep driving around together. Rory, because she clearly is meant to be with Jess and not Dean, says turn right. Surprise, surprise. They get in a car accident and Lorelai freaks out, yells at Luke and tells him to go to hell. Luke ships Jess back to NYC and that’s that. Only it isn’t because Rory is smitten with Jess. A few weeks later she skips school (and misses her mother’s community college graduation ceremony) to take a bus to the Big Apple to see Jess. I remember when I was watching this the first time around that I rooted for Jess when Rory was with Dean, but the opposite became true later. 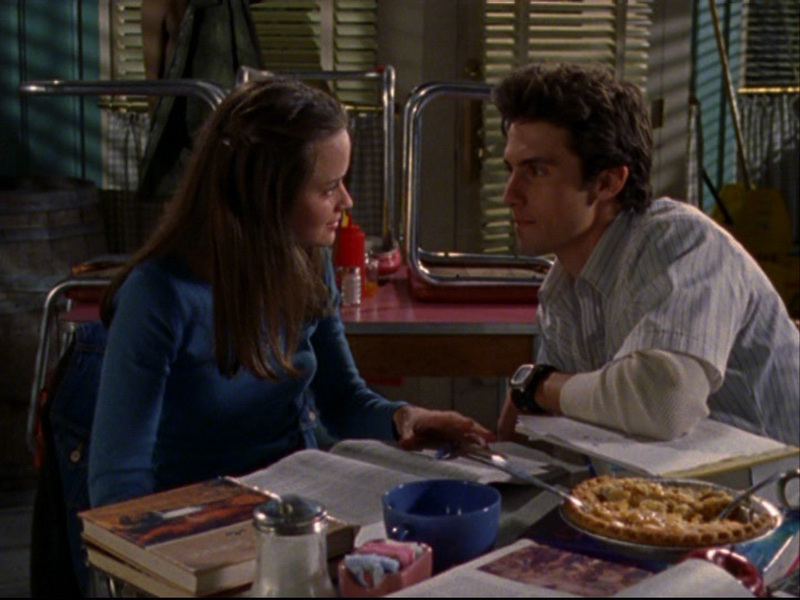 This time around, however, I think I understand relationships better and refuse to believe Rory was meant to be with anyone other than the bad boy. All of this culminates with Jess telling Luke he wants to move back to Stars Hallow and will change his attitude. Luke warns him not to go near Rory, but he shows up at Sookie’s wedding in the final episode and the two kiss. While all of that was going on, Chris showed back up in the Girls’ lives and he and Lorelai are going to become a thing because he had ended things with Sherry. That is until she calls and says he’s pregnant. It’s a bummer and we definitely leave the mother and daughter in a state of flux as the second season comes to an end. But it’s true what they say about television: season three is when a series hits its peak, and Gilmore Girls is no different. Other great moments from this batch of episodes is seeing Richard’s transformation from a moping retiree back to a thriving businessman thanks to a great episode when he is an adviser to Rory’s school project. Another nice combination was when Lorelai and Emily attend a spa for the weekend. These types of episodes are a good break from the overall arc, but they don’t hinder progress of the characters. I’m glad the writers decided to start expanding the material they cover. A final note: Seth MacFarlane appears as a fellow graduate of Lorelai’s business school. Love it. He’s certainly come a long way.